“ we get drunk on the most potent brew of all…talk, talk and more talk"
Opened in 1995, Swift Hibernian Lounge has long been a beacon for those in search of simple Irish hospitality and the dying art of conversation. 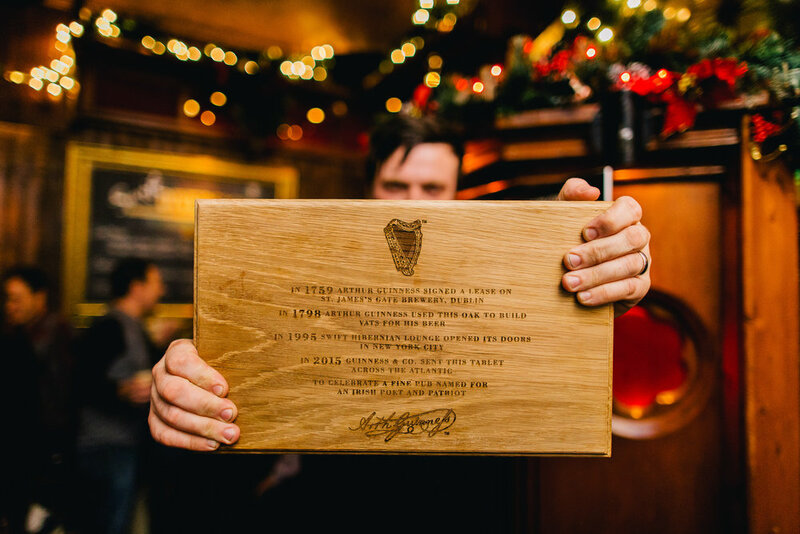 A stubborn hold out from the lure of television screens and other electronic distractions, Swift has become the quintessential Irish Pub for the modern age. An oasis of conviviality in a nonconvivial world. Founded by Danny McDonald and Mike Jewell, and later joined by Anthony Malone, Swift quickly became known for a cornucopia of beer styles from here and abroad, one of the finest selections of Irish whiskey in the city, and, of course, its often-applauded attention to detail in pulling the perfect pint of Guinness. Named for Jonathan Swift, the great Irish patriot and writer, the bar is furnished with reclaimed church pews and a pulpit from Swift’s own parish in Laracor, County Meath. Swift’s visage in oils casts a watchful but merry eye over the proceedings at the main bar. Swift Hibernian Lounge has garnered praise from the world’s top researchers into drink, including Dale “King Cocktail” DeGroff, Esquire Magazine’s David Wondrich, and Gary “gaz” Regan. You may find them elbow to elbow at our bar, alongside anyone else who knows a thing or two about the proper enjoyment of life.